PATRIOT — The Gallia County Canine Shelter, the Gallia County Sheriff’s Office and the Humane Society of the United States partnered to rescue about 70 dogs and three horses Thursday from potentially dangerous and unsanitary living conditions on a property along Wagoner Road. According to Gallipolis Municipal Court records, Jackie Morgan, 57, of Wagoner Road, has a pending Gallipolis Municipal Court case regarding the reported second-degree misdemeanor crime of animal cruelty. Gallia County deputies served a search warrant at Morgan’s property around 8 a.m. Morgan surrendered animals to the sheriff’s office and others have been taken from the property by the sheriff’s office barring the result of final court decisions. 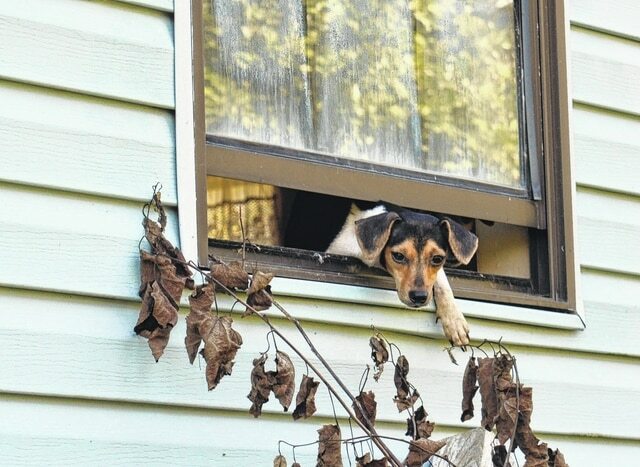 Laurie Cardillo, Gallia County dog warden, said she has collected animals from the location in the past and said the residence has reportedly been an ongoing problem for roughly the last two years. After taking reports from neighbors of Morgan in regards to loose dogs killing animals on their property, Cardillo reached out for help. Cardillo said she has returned to the property about once a week for the last year and a half to deal with animal complaints. She said she believed the Gallia Canine Shelter had taken a minimum of 40 dogs from the Morgan residence last year. The Daily Tribune was on the scene as dogs were collected from the residence. Some were reportedly trapped in safety kennels, roaming the property or removed from an abandoned trailer and shed. Some dogs were inside the residence itself and enclosures about the property. The smell of ammonia and sewage was strong around the structures and a number of puppies, as well as adult animals, could be found. Some animals had patchy spots of hair or signs of poor health. HSUS responders reported high ammonia levels in the structures. Animals had limited access to food and water and in need of urgent veterinary care. Veterinarians Dr. Michelle Gonzalez, of Rascal Animal Hospital, and Dr. Jennie Hayes were on scene to deliver emergency fluids. Dr. Brian Hendrickson, of Riverbend Animal Clinic, was also available to see to the health of the horses collected — the youngest of which was 4 months old. The mares were respectively guessed to be 5 years of age and 18 years of age. Handlers said it was their opinion the horses seemed to have had little traveling experience and were anxious. It took about one hour to get them moved into a trailer for transport. Handlers said the animals appeared underfed. Horses were to be taken into the temporary care of Autumn Thomas. The dogs were taken to an undisclosed location for closer medical examination and emergency veterinary care. Animal rescuers with the Humane Society of the United States process around 70 dogs Thursday and inspect and catalogue them before being taking the animals to an undisclosed location in Gallia County for further health examination. One dog leans out the window as animal rescuers approach a house that housed several dozen dogs as well as puppies.